The Manager by Designsm blog discusses the art of providing feedback, such as making your feedback specific and immediate and attempting to describe the preferred behavior. Now let’s take this to a new level. When giving performance feedback to an employee, you are in the position to specifically articulate what you want the employee to do. This is handy information, because it could be a clue that you never actually set this expectation in the first place. Let’s say you are in charge of a team working on a significant systems delivery. The team has been working on it for a couple of months without significant issue, and the Vice President comes into your office saying, “I don’t know what’s going on with this systems delivery project!” OK, so this is a problem. Something needs to be solved. You determine that the VP wants a visibility to the project status, and you work out a format and timing for getting this info to the VP. Nobody wanted this crisis to happen, but it did. The Manager by Designsm blog writes about the art of providing performance feedback. That’s because performance feedback is a fundamental skill needed for managers to perform their jobs as managers. One important aspect of providing feedback is that it is based on some sort of standard, a bar that has been set, or a series of expectations of performance. So let’s talk about it! In my prior article, I offer providing expectations as an alternative to giving public feedback. But there are more advantages to setting expectations than being perceived as a forward, clear thinking manager who knows what she wants and how to get there. I suppose that’s reason enough, but there are more reasons to hone your skills at providing expectations! Providing expectations also give you the ability to give performance feedback more effectively. The formula is simple: If you’ve set a performance bar in advance, when you give feedback to your employee you can now measure against that expected performance. What’s amazing is how infrequently this is performed by managers. So I hereby set the performance expectations to managers: Have you set performance expectations to your employees? If so, great! You are now ahead of the game. I have written in the Manager by Design blog about the scourge of public feedback. Public feedback is when managers try to solve performance problems by addressing their entire organization at once. I make the case that doing this a) does not change the behavior of the one needing to change and b) could make worse the behavior of those who are already performing correctly. Public feedback is an example of a manager short cut and should be stopped. So let’s look at — in a more positive manner — what a manager should focus on doing in a public setting: Setting expectations. I would like to recommend to all of you managers out there to focus your announcements, all-team meetings and proclamations on the theme of setting expectations. Doing so will help you down the course of leading, and the more you set expectations with your staff, the more likely they will actually do the things that you expect. So let’s look at some of the things you can do to set expectations. Perhaps this is too simple of an idea to even document, but how often do you hear managers doing this? Not enough in my estimation, so let’s increase this introductory statement on the part of managers. By using the “I’d like to provide you my expectations” line, you are now forced to articulate what you do want. In doing this, you can now embark on a project that allows you to identify the behaviors and values that you’d like to see on your team. Let’s try a few! I have recently written a series of articles on the topic of how managers obtain feedback on how they manage. Conclusion: It’s spotty. I’ve also recently published a series of articles on how employees can give feedback to managers. Conclusion: It’s possible, but takes a lot of work. Even the people who would best be able to give feedback, the manager’s employees, have to go through many machinations just to get to the point of providing corrective feedback, and it still isn’t without the associated risks of recrimination over time. Boo to that! This is an important topic, because receiving performance feedback on how you are doing a job is a critical component for obtaining minimally acceptable performance, and then — let’s aspire to this — accelerating to high performance. Getting better at what you do simply isn’t possible without some sort of systematic performance feedback mechanism. So that leaves one more option to consider: Bringing in a 3rd Party. 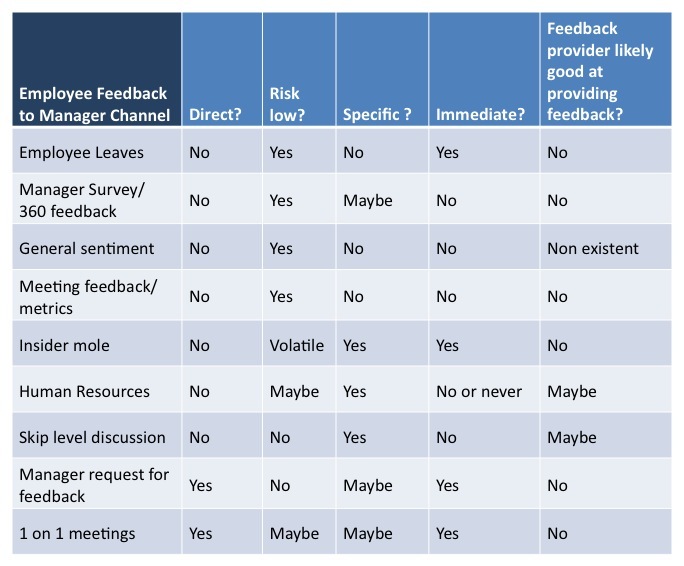 Let’s take another look at the grid of options for how managers receive feedback on being a manager (initially published in How to give feedback to your manager: Some possible openings). 5. Preparing for giving the feedback. Yes, it’s a lot of work to get to this point. But hopefully you’ve discovered that the very act of doing the previous steps will a) Actually solve problems you’re experiencing already and b) keep you focused on what areas you’d like to give feedback. Today, I’ll provide you some phrases to help you perform the feedback discussion on behaviors you’d like to change in your boss.